Bhimashankar Wildlife Sanctuary is situated on the brink of a humongous cliff – at the height of about 3800 feet from the sea level, with an undulating surface dominated by moist-deciduous and semi-evergreen forests, and flat tops characteristic of plateaus. There are several countless streams meandering through the forests and the meadows that converge and flow as the Bhima River, which then spills into Krishna River – providing the waters and sediments to the Deccan plateau of the east, until the very water off the streams of Bhimashankar, in bond with several tributaries of Krishna greet the Bay of Bengal thousands of kilometers away as one. Once atop this mountain range, we unloaded and planned our day. It was going to be the best time in my most anticipated visit. Bhimashankar Wildlife Sanctuary had always been in the back of my mind since a few years. I had only heard of its flourishes – of giant red rodents in its boughs, of scorpions teeming under the rocks, and of herptiles that I never knew existed. And here I was, finally, after planning and disappointingly cancelling it a few times the previous weeks. 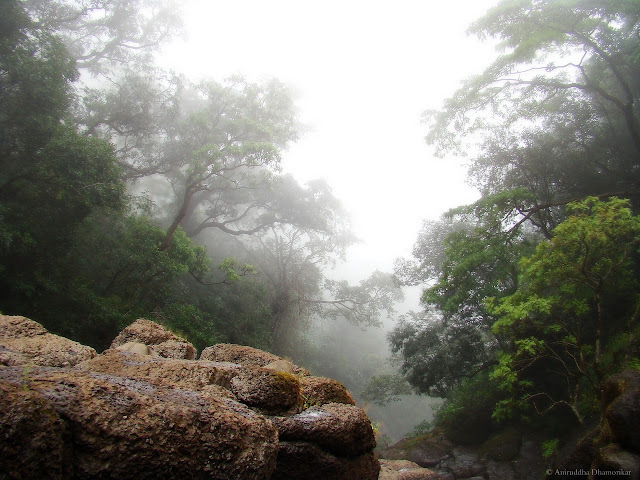 Bhimashankar contains several sacred groves, which are forests protected for hundreds of years for their cultural significance. In its boughs lives a subspecies of the Indian Giant Squirrel – Ratufa indica elphenstoni, found nowhere else on the planet – and for its protection Bhimashankar was declared a Wildlife Sanctuary in 1985. It was quarter past noon, the sky was clear and the sun shone merrily onto us. In only two hours thence, I felt the first trickle of water, and later a deep gurgle of the skies. The thunderstorm from the Konkan plains had followed us here, much to our disappointment. The weather turned against us. It thundered and the trees shook, sending shivers down the roots and down our spines. Rain in the month of October and into its second week is very, very uncommon. These thunderous showers are in fact the retreating monsoons, the last procession of the clouds as they parade on their northerly route guided by the western crest of the Ghats. They are two to three weeks late this season, and are filling the already brimming water bodies. It was a rather wet season this year. On the contrary, there were drought conditions in several parts in the rain-shadow region along the east-side of the Ghats. This heavy downpour, with monsoons arriving a week early and retreating two weeks later may be attributed to the La Niña phenomenon underway this year, when the ocean surface temperature is lower than normal by a few digits. During a La Niña event, the weather is at its worst, lashing coastal areas with unprecedented storms. It is said that the following year will also be a La Niña year, and the rains might be as severe as this year. However, La Niña is followed by a strong El Niño, when the oceanic temperatures are slightly above normal – and are worrisome since drought seasons peak during this event, as it was experienced in 2008. So we were amidst this thunderstorm when we decided to take the Gupt Bhimashankar trail that goes downhill from Bhimashankar Temple, following the juvenile Bhima River. And you know what? It was one of the best walks amidst a growing thunderstorm and a darkening landscape. It was very quiet, but in the understory of the semi-evergreens were butterflies – two Common Mormons dancing midair – a male chasing the female at her tail – a beautiful display of courtship. And there were birds – a Blue Rock Thrush, Orange Headed Thrush and a White Bellied Blue Flycatcher trying to find the best hiding spot. We walked for several meters through the primary forests – the very few remaining virgin forests along the Ghats. And it opened into a ravine, so we climbed down to it – to this magical land where the waters flowed steadily and fell off a fall as mist. Clouds ascended from this ravine and lifted into the skies with haste, as the crackling in the heavens above rose in unison and passed on as a great, loud sigh. The music of the storm to the tune of a White Cheeked Barbet in the background of the rippling water is the best music one can ever imagine. And we were living it. There were many fishes silently browsing in the still streams. Most of them were Loaches. So the fisherman in me came to life, and he fished the fishes out into a transparent bottle. They were not to be substituted as supper, though. They were humanely caught solely to be photographed. When it comes to study ecology, even today, freshwater fishes are studied mostly for their commercial value. 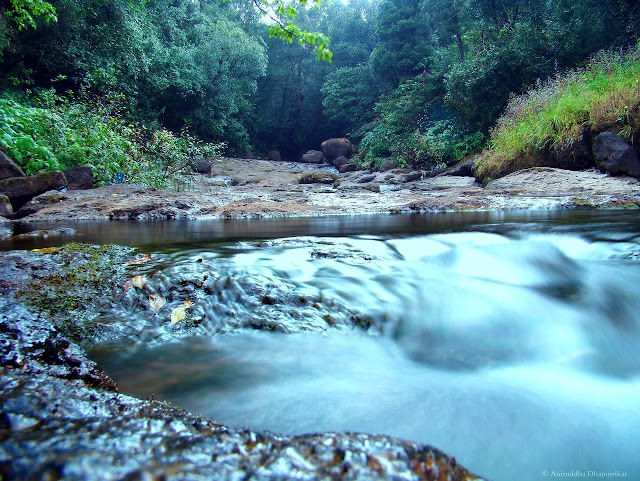 Western Ghats harbours many endemic fishes in its wetland ecosystems. Although freshwater fishes of India have been studied to a limit, we amateurs find it really difficult to have them identified. Therefore I was inclined to take a better look at them, and that wouldn’t be possible without capturing them. They stayed in the bottle only for five minutes, and I assure you they were out and happy with their gang at the bottom of the stream once they returned! These loaches are in the family Balitoridae, Indoreonectes evezardi, an endemic of the Western Ghats. They come in various sizes – largest being little over an inch in length, and their habitat is these slow flowing rivers and streams, as they cling onto submerged boulders and scavenge in the benthic of the mountainous regions. They were released where they were caught and then we proceeded across the stream, hoping that the lightning does not strike the nearest tree to us but the farthest one would do. We found a large Plesiophrictus, a Burrowing Spider in the family Theraphosidae on our path. As it got darker with every step, we decided to return to our shelter, and to wait out for the storm to pass – which it didn’t. It was as if the sky was spilled purple and pink and a speck of golden dust sprinkled upon its crest. The setting sun, the dispersing clouds, and the low lying haze over the lands below put up a fabulous show for us, as the sun’s rays were filtered and re-filtered until only the shades of red and orange dominated. 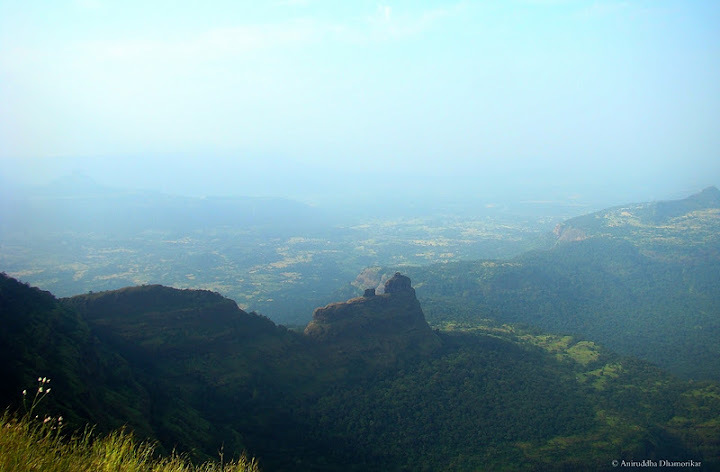 This view, photographed from the so-called Bombay Point, overlooks to the west of the Western Ghats. Far in the distance hidden in haze lie a jagged mountain range of Matheran and Karjat beyond those is the city of Mumbai and the vast plains that we see are dotted by villages and winding rivers. This is now imprinted in my memory, and I thanked the thunderstorm for once. In the night we emerged again to explore the roads that were drenched in rain. The air was thick with mist, and it was cold. A large Asian Palm Civet crossed our path and rushed under the thickets. Since it was as wet as it is in the month of July, there were frogs everywhere. We counted several ones, from the omnipresent Skittering Frogs, the Fungoid Frogs and Common Indian Tree Frogs, Common Indian Toads and also Bombay Bush Frogs. But we were cut short by the intensifying rains and the approaching lightening. And I was restless for the rest of the night, for the hunger to explore under a clear sky burned my stomach. I woke up before the alarm went off, and looked at the clear skies. We set out on this glorious morning to Nagphani point, a mighty cliff standing tall about the rest, overlooking the landscape to the west. The air was filled with the chuckle of the Indian Giant Squirrels, the incessant tune of White Cheeked Barbets, the sweet melody of Malabar Whistling Thrush, the chattering of Stone Chats, the shrieking of Macaques and the mocking laughter of a Long Tailed Shrike. This Monkey Beetle was very common throughout the trail; some of them were feeding on Senecio flowers. And some were hanging around with their strong hind limbs from leaves and the inflorescence of grasses, like monkeys in trees. Since I have been talking about passing through Karvy thickets in practically every expedition, I think this was a worthy gift on behalf of Karvy. This species is known to mass-flower once in seven-eight years, however there are few individuals that flower sporadically. And it is a real challenge to stumble upon them. It is akin to finding the treasure amidst a treasure. Bhimashankar blessed us with something that I did not imagine seeing this year, or for several years to follow. The last mass flowering was in year 2008, and the next will be in 2015. Over and under the cliff we stood upon flew some of the fearsome raptors on this planet – one of them was a Common Kestrel. There were two more birds of prey, a pair of Black Shouldered Kite and a Crested Serpent Eagle that scoured the lands down below. And as I stood and watched, my mouth agape, fresh air filled my lungs – freshest of the fresh that my lungs ever yearned for. And my mind cleared and fell silent. I was breathless and frozen in that moment. The two rouges were back on the way home at noon, being chased by another thunderstorm on the way down the mountains. The humidity increased as they descended, until they felt its grip on their necks and filled their lungs with its heaviness. But I was lost in that moment at the top of the Ghats. And I did not come back. A wonderful read about a wonderful place. Thank you. a wonderful sanctuary! Lovely forest, rivers and cliffs! Amazing how many animals are around there. And you saw a civet- they are beautiful! The loach looks like Acanthocobitis moreh. Did it look like this? Thank you for your valuable inputs, Big B! These loaches are really difficult to identify! I'll lookc into Acanthocobitis, although it looks quite similar to Indoreonectes everzadi. Khatarnak Pics.. :D Especially the Frog one..
Can u suggest some place to stay der and wud it be worth visiting next week that is around 25th Dec? Hello Inspire_SJ, you can try googling Blue Mormon Jungle Holiday Resorts, or there are a few small, cheaper ones just near the Bhimashankar temple. The only option is Blue Mormon Jungle Holiday Resort for families that I know of but it will be convenient only if you have your own vehicle, rest others are small ones mostly for pilgrims.